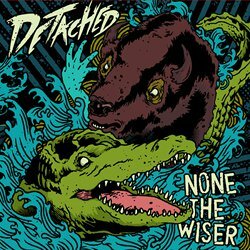 Detached – None The Wiser CDEP - Old Punks Never Die! Detached play some competent and energetic third-wave style ska, with fast guitar chops, strident beats to move the feet, frenetic basslines and a full complement of brass laying down some smooth rhythms. I’ve got to say that I find the main voice slightly annoying – I really don’t like the faux American twang that seems to creep in to quite a few non-Yank ska bands’ tunes, and I also found it to be a bit scratchy on my ears at times. But overall, that’s no big deal. The well-contructed melodies behind them ensure the whole lot hangs together pretty solidly. A classy production job also helps. The lyrics are well-written but, again, don’t really float my particular boat. I don’t mind the odd tune that gets into the whole life, love and loss thing, but I struggle when it’s nearly every song. I guess that’s as much about me being old and jaded as anything else. I shouldn’t forget that these young pups will still be riding emotional rollercoasters that need an outlet somewhere. And this is certainly a better way of doing it than standing around on street corners mugging old ladies. Overall, these are tunes that I’d enjoy if they popped up on a compilation disc, something like the ‘Hey Brother…‘ series that I still love to this day, but are harder work listened to all in one go. And, at four quid to download six tracks (albeit well-polished ones) and six quid for the hard copy, I wouldn’t rush out to buy it. Those with youth on their side may well have a different experience. Listen to the entire EP for free on the group’s Bandcamp page. If you like it you can buy the download from there too. Hard copies and other merch can be found in their Big Cartel store. I think these are from Caerphilly. Were at Kippertronix in 09. I danced (more fell and rolled around the floor bumping people high on jub). They was alright if i recall. Just found their demo cd the other day.